• Radish - 1 number. • Tamarind - 5-8 grams. • Green chilli - 5-6 numbers. • Coconut pieces - 1/2 cup. In a pan heat oil add cumin seeds, when cumin seeds splutter, add sesame seeds, tamarind, radish pieces, salt, and turmeric powder, cook till the radish pieces are tender. Then add green chilli saute it for 2 minutes and add coriander, coconut pieces, mix it and switch off the flame to let it cool down. Transfer it into the blender and make a coarse paste. Serve this with chapati or rice. This very tasty combination of radish and coconut made into a chutney goes very well with flavored rice and curd rice. Radish and coconut chutney healthy dish combining Read More..
Radish and coconut chutney healthy dish combining radish and coconut. Tastes very well with flavored rice and curd rice. 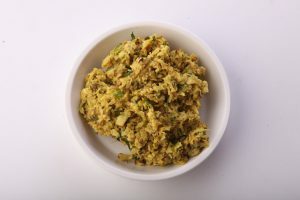 Radish and Coconut Chutney is an unique fatta fat dish with amazing and delectable flavors lingering around your palate. This chutney goes very well with any type of flavored rice or curd rice. You could also eat this chutney with any type of Indian flat bread. Radish and coconut chutney is an absolutely rare combination of ingredients that are mixed with spices, sesame seeds all blended together coarsely. Radish and coconut combined together is a very rare combination. The coconut is an awesome natural fresh food item that has a pleasant sweetness and nutty flavour. It blends well with any type of savory or sweet dishes. In southern India, coconuts form a part of daily diet in some way or other like using of coconut oil for cooking, using grated coconut for preparing chutneys or garnishing the curries, etc. Heat little oil in a pan and add cumin seeds. When cumin seeds splutter, add sesame seeds, tamarind, radish pieces, salt and turmeric. Cook until the radish pieces are tender. Add green chillies and sauté for 2 minutes. Add coriander leaves, coconut pieces and mix well. Switch off the flame and allow cooling. Transfer into the blender and make a coarse paste. Radish is a very healthy and nutritious root vegetable. It is one of the vital ingredients in Indian cuisine where some awesome dishes are prepared with this humble root vegetable. In north India, radish is often used in preparing the Mooli paratha while in southern India; radish is used in making of various stews like sambar etc. You can also use the greens of radish in making stir fries. It is very nutritious and good for diabetic patients. Radish as such is rich in folic acid and other minerals. It can be mixed in the salads or even eaten raw. But some people avoid eating raw because of its pungent taste and smell. It is also a good appetizer, mouth and breath freshener, laxative, regulates metabolism, improves blood circulation, is a good treatment for headache, acidity, constipation, nausea, obesity, sore throat, whooping cough, gastric problems, gallbladder stones, dyspepsia etc. Radish is often used in salads, as well as in many European dishes. It is extensively used in north Indian cuisine especially for preparing the Mooli Ka Paratha (Indian bread stuffed with grated radish and spices) or Mooli ki bhaji. Radish is also added to yoghurt and eaten. It’s very refreshing and cooling. The vitamin C in radish is an antioxidant and anti-inflammatory, and has been shown to have a positive effect on asthma symptoms because of its anti-inflammatory properties. The earthy spicy flavor of radish unlike any vegetable brings out amazing flavors and taste to the dish. In Southern states of India like the Tamilnadu, Andhra Pradesh, Karnataka and Kerala, no breakfast is complete without the coconut chutney. A perfect blend of different flavors and the ease with which it can be prepared is a great example of tradition, health, nutrition and raw cuisine. Chutney usually are wet having a coarse to fine texture. In the past, chutneys were ground with a mortar and pestle made of stone or an ammikkal (Tamil). Nowadays, electric blenders replace the stone implements. Various spices are added and ground, usually in a particular order; the wet paste is than tempered with spices in vegetable oil, gingelly or groundnut oil. Coconut is used in various ways for culinary use. The white flesh meat in the coconut is edible and can be used fresh or dried for cooking. It is used for making chutney, adding few spices to it and makes a aromatic masala for curries and gravies. The fleshy part can also be used to produce coconut milk which are used in various aromatic and flavorful dishes like cooking fish in coconut milk with spices or for making a delectable creamy kheer/ payasam (Indian dessert). Do try preparing this awesome, finger licking fatta fat chutney as it’s the fresh homemade chutneys that always add an exotic Indian touch to any meal. These recipes are so fast it's hard to believe they are real! ?